My sculpture “Find the The Key, Win My Heart” is finished! I apologize for the pictures – but you get the gist. I’ve read articles from artists who feel the interpretation for the meaning of their art should be left up to the viewer. It’s not me. It’s not that the viewer shouldn’t interpret my art work for themselves – finding their own meaning. My art usually isn’t random – it comes from a specific emotion. I began this piece to learn how to make a full bodied person. As it progressed I was looking for a feeling, a statement – I didn’t have it in me to just make a body. I opened my “Old Junk Treasure” drawer and came across a metal key hole (the muse). That led me to think I could use a red enameled heart that my sister had on a pin as it’s heart. Thus began the meaning of this piece, what I feel makes a person -their heart – and my emotions kicked in. Here is a person who isn’t throwing their heart to every passer by but is saying “I’m here, I’m worthy, if you’re truly interested, pick up the key”. I think that’s what we all want, even as children – to be wanted, to be included, to be loved, to be relevant. In short, this piece is saying “Pick Me”. Find The Key, Win My Heart – Finished! Featured on page 57 of the Premier Issue of Cloth Paper Scissors “PAGES” magazine. 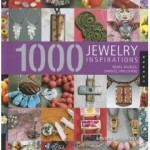 A beautiful book about Jewelry featuring two of my pieces. Look for one of my Carpart Art pieces in the book 1000 Creative Ideas for Reuse! © 2019 smARTaleck studio. All Rights Reserved. Please request permission before using any images.